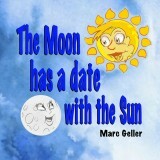 The Moon has a date with the Sun by Marc Geller is a fascinating story for children. The illustrations are fabulous – bright, cheery, realistic portrayals of cityscapes, day and night sky, and more colourful, beautiful pages by very accomplished artist Robert M. Henry. The Sun is king of the sky, but he gets lonely even though he demands he is the only one who can take up space in his sky. A little cloud befriends Sun and suggests maybe he and Moon can meet. Moon is lonely too and is interested when the cloud mentions the possibility of her having a friend. Sun and Moon begin to have hope. You have to read this yourself to see what happens. It’s a cute story, one which children will love to read or to have read to them. The words are rather advanced in places for the youngest ones, but it’s a great way to introduce words with their meanings in context. It also will teach them some historical facts in a fun way. The Moon has a date with the Sun is quite a different story, well done and interesting, almost like a fable. You can find The Moon has a date with the Sun listed on my BUY THE BOOK! page. This entry was posted in Mostly About Reading, Reviews & Interviews and tagged children's book, children's fiction, friendship, illustrations, loneliness, Marc Geller, Picture book, Robert M. Henry, The Moon has a date with the Sun. Bookmark the permalink.